Top quality high-vacuum diode rectifiers manufactured in the United States by world-renowned Cetron. 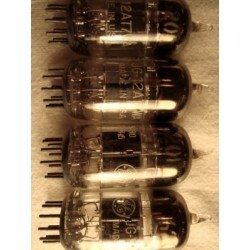 These 4-pin thick glass enveloppe tubes with thoriated tungsten filaments, gray plates, and bottom halo getters, are designed for use in rectifier units, voltage multipliers, and other special circuits submitted to extreme ambient temperature, high operating frequencies, high PIV, and HF transients. They are printed in blue CETRON 8020W MADE IN U.S.A., and blue and white boxes are printed 110CV.